Anthony Francis Lucas (born Antun Lučić; September 9, 1855 – September 2, 1921) was an American Croatian-born oil explorer. With Pattillo Higgins he organized the drilling of an oil well near Beaumont, Texas that became known as Spindletop. This led to the widespread exploitation of oil and the start of the petroleum age. Lucas was born into a Croatian family of shipbuilders and owners  in the city of Split (Austria-Hungary; today Croatia). At the age of 20, Lucas completed studies at the Polytechnical Institute (Technische Hochschule) in Graz, Austria and became a mechanical engineer. After entering the Austrian Naval Academy, Lučić served in Pula and Rijeka and rose to the rank of second lieutenant. In 1879, Lucas visited his uncle in Saginaw, Michigan. There he settled and changed his name to Anthony Francis Lucas, receiving his naturalization papers on May 9, 1885 at Norfolk, Virginia. He married Caroline Weed Fitzgerald. They moved with their son, Anthony Fitzgerald Lucas, to Washington, D.C. in 1887. He found employment in the lumber industry and later prospected for gold and rock salt from Colorado to Louisiana. In 1893, Lucas started to work in salt exploration in Louisiana for a New Orleans company at Petite Anse (Avery Island). He worked at additional locations (Grand Cote, Anse la Butte and Belle Isle) until 1896, gaining experience that led to his promising of idea of the possible relationship between the salt deposits and the sulfur (most probably even crude oil) in the tertiary sediments of the Gulf Coast region. Most geologists disagreed with Lucas' theory. However, as a result of explorations undertaken and his experience, he was the foremost expert on these formations in the United States. In 1899, Lucas became a drilling contractor and leased land south of Beaumont, Texas from the oil explorer Pattillo Higgins. He believed that the site — Spindletop Hill — was covering a vast pool of crude oil. Drilling began in late 1900 but was extremely difficult. At the depth of 60 metres (200 ft), a layer of sand was found. The new rotating hydraulic drill collapsed upon reaching a depth of approximately 275 metres (902 ft). Not able to deal with the technical difficulties, and short on money, Lucas asked for help from John D. Rockefeller of Standard Oil. Rockefeller passed but not before persuading John H. Galey and James M. Guffey, associates of the Mellon family from Pittsburgh, Pennsylvania, to join the project. After reaching the depth of 370 metres (1,210 ft), at 10:30 AM on January 10, 1901, natural gas erupted followed by a stream of crude oil reaching 60 metres (200 ft). The eruption lasted nine days and was stopped by one of Lucas's devices. 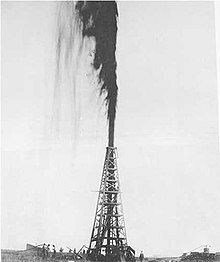 The "Lucas Gusher," also called the "Lucas Spindletop Gusher," produced around 100,000 barrels (16,000 m3) of oil a day. The occasion was witnessed by about 50,000 spectators. The population of Beaumont mushroomed from 8,000 to 60,000 within a year. By 1902 as many as 285 wells were operating on Spindletop Hill and over 600 oil companies had been chartered. Lucas possessed just a tiny share in a company he helped to establish. Because of this and other reasons, he left the company at the end of 1901. The Lucas Gusher helped revolutionize world fuel use and transformed the economy of southeast Texas. It helped further the development of the combustion engine automobile since significant amounts of energy were needed for fuel. The city of Houston become the national center of the oil industry, with the United States surpassing Russia as the world's leading producer. Anthony Francis Lucas is considered to be the founder of modern petroleum reservoir engineering. He later served as a consulting engineer in Romania, Russia, Mexico, Algeria, as well as in the United States. As successful businessman and expert in mining, Lucas was the lifelong chairman of American Committee for Oil and Gas. Lucas died on September 2, 1921 in Washington, D.C.. He was often mistakenly described as Austrian, sometimes even as a Trieste-born Italian. On his grave in Rock Creek Cemetery in Washington, D.C. he is described as being of Illyric origin, which was the standard term for Croatian at the time. In 1936, the American Institute for Geological and Metallurgical Investigations founded the Anthony F. Lucas Gold Medal prize for development in the area of oil exploration. A museum with a granite obelisk was built to honor the explorer about which is inscribed: "On this spot on the tenth day of the twentieth century a new era in civilization began." A street and an elementary school in Beaumont, Texas bear his name. ^ "LUCAS, Anthony Francis". The International Who's Who in the World. 1912. p. 718. ^ Adam S. Eterovich. "Luchich Discovery of Oil at Spindletop, Texas". croatianhistory.net. Archived from the original on 29 June 2010. Retrieved July 17, 2010. This page was last edited on 3 April 2019, at 10:58 (UTC).